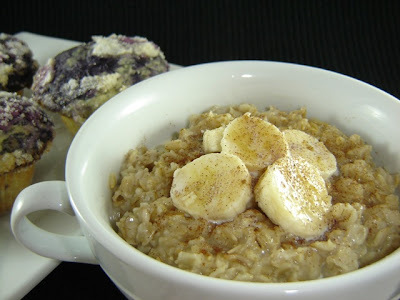 I saw this oatmeal on a recent episode of Paula Deen and boy did it sound yummy!! 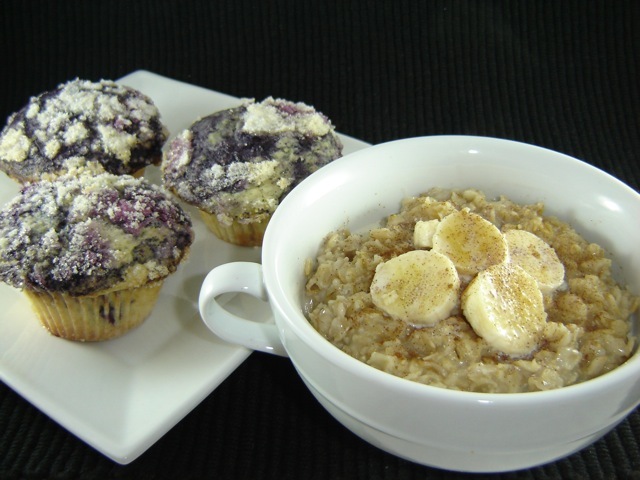 Did you know that oatmeal is actually really healthy for you? At least it is before you add all the yummy fixings to it!! If you want to keep it super healthy, just add banana, low-fat milk and a little cinnamon to it before serving. I served mine the way Paula suggested, with a little cream, brown sugar, cinnamon and bananas and it was sooooo yummy!! Let me just tell you, the banana is a must, do not skip that ingredient. If all of those health benefits didn't convince you to try this, then I don't know what would. So, just give this oatmeal a try. It is cheap to make and it is ready in under 10 minutes. What a great way to start the day or to end the night! I served my oatmeal with the best blueberry muffins I have ever had! In a medium saucepan, bring water to a boil and add salt. Stir in the oats and simmer until thickened, about 6-8 minutes. Spoon into bowls and top with desired toppings. Yield: 2-3 servings. Derek always eats oatmeal in the morning...sometimes I try to gag it down. I will have to try this recipe though, because I'll bet I would like it.